Your garbage disposal may seem all-powerful, but like any other appliance, it has its weaknesses too. It’s easy to use and helps you avoid unpleasant odors in the trash, but as convenient as it is, the disposal isn’t meant to handle every type of food. In fact, some items can damage your disposal, necessitating repairs or even replacement. Find out what you need to avoid putting down your garbage disposal to keep it running smoothly. Grease and oils may easily slide down the disposal, but fats distribute a greasy film over the blades, which makes them less effective. The grease and oil from foods also can solidify and build up in the pipes, resulting in clogged drains and expensive rooter bills. 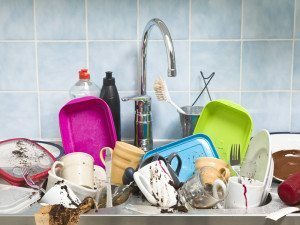 Like grease and oils, coffee grounds seem to go down the garbage disposal quite well, and many homeowners rely on them to help eliminate sink odors. Over time, however, grounds can build up in the pipes like sediment, backing up the works and causing issues with the disposer’s function. Fibrous foods, including celery, corn husks, asparagus, leeks, carrot peels and onion skins can become wrapped around the blades of the disposal. This exerts resistance on the blades and prevents the motor from operating properly. Similarly, the membrane on the inside of eggshells can wrap around the disposal blades, resulting in damage. Small amounts of these foods may not cause problems, if they are accompanied by strong stream of cold water before, during and after using the appliance. Whenever possible, just toss these troublemakers into the trash or compost pile instead. Foods that expand when cooking, such as pasta, beans, rice and potato peels, also do not belong in the disposal. Even after being ground up, these foods can continue to absorb water, forming a paste-like substance that can clog the disposal and pipes. Though some people believe that occasionally grinding up certain types of hard materials can clean the walls and interior mechanisms of the disposer, these items actually can cause significant damage. A small chicken or fish bone or a few eggshells here or there may be fine, but any hard item such as the pits from peaches, plums, cherries, avocados and other stone fruits and berries can potentially wreak havoc as they bounce around in the disposal. Non-food items are never appropriate for the garbage disposal. Cigarette butts, sponges, plant clippings, plastic, paper and other non-food materials cannot be broken down enough to wash them through the appliance and the drain. A good rule of thumb is that if you can’t eat it, neither should the disposal! By following these simple tips, you can keep your hungry sink friend running smoothly and efficiently. If something does go wrong, Complete Appliance Repair is here for you. Contact us today for all of your home appliance sales, installation, maintenance and repair needs, including help with your garbage disposal. This entry was posted in Blog and tagged Garbage disposal Maintenance, Garbage disposal repair on November 6, 2015 by admin. Does your garbage disposal need replacement or merely repair? You can recognize the warning signs of serious problems if you know what to look for. Calling for minor repairs or maintenance at any sign of trouble may help prolong the life of your unit. But, as with any appliance, you may want to consider replacement at some point. Following are some signs that now may be the time to think about purchasing a new disposal. Issues with the motor are sure signs that you need to replace your garbage disposal. But how can you tell if you have a motor problem? You may think your disposal is broken if it will not turn on, but you could be wrong. You may be able to press the reset button on the bottom of the unit or flip the circuit breaker to get the unit working again. If those don’t fix the problem, the motor may have a fault. Another indicator of possible motor issues is excessive or unusual grinding sounds or a great deal of vibration. Even if your disposal is not showing obvious signs of damage, you may want to consider replacement if is not running optimally. Though garbage disposals are generally designed to last about 10 to 12 years, wear and tear through regular use can cause them to work less effectively and run more slowly. Likewise, improper use will result in premature failure. If your household routinely does a large amount of cooking, it may be a good idea to replace your garbage disposal with a model that has greater horsepower to better handle the job. 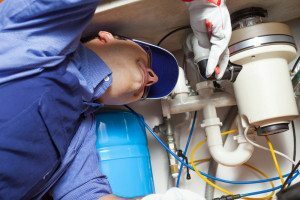 Some problems with garbage disposals can be easily repaired. For example, if the flywheel becomes stuck due to something being lodged in the unit, a repair expert can remove the item to restore functionality. 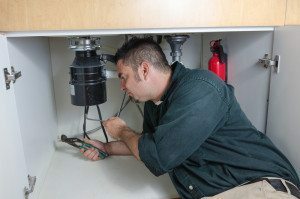 Or, if the disposal springs a leak at the sink flange, dishwasher connection or discharge drainpipe, an experienced disposal repair technician can tighten the bolts and clamps. But if these or other repair issues occur frequently, it may be time to replace your disposer. Repeated problems with any home appliance is a definite sign that you need to purchase a new model soon. Not sure if your disposal needs repairs or if you should just buy a new one? 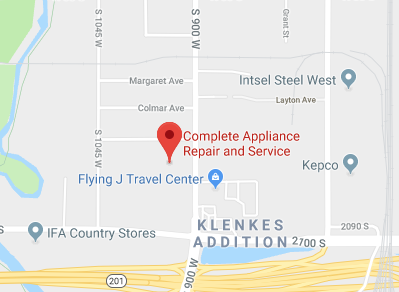 Schedule a free consultation with the professionals at Complete Appliance Repair in Bountiful, Utah. Our experienced technicians can troubleshoot the problem and recommend the most economical approach to repair or replacement. Call us today if you suspect it’s time to replace your garbage disposal. This entry was posted in Blog and tagged Garbage disposal Maintenance, Garbage disposal repair on October 8, 2015 by admin. Regular garbage disposal maintenance will add years to your equipment’s working life. Taking a few sensible precautions and maintaining regular upkeep will ensure it is working at peak performance levels whenever you need it. Your garbage disposal works by shredding food debris so that it can pass harmlessly through the sewer system. Although the disposer is a real workhorse, it can become clogged with pieces of food or other items it isn’t prepared to handle. Here are a few tips and tricks that will help you properly care for your garbage disposal. Clean your disposal regularly. You can choose one of two methods. You can fill it with ice cubes and one cup of rock or coarse salt, then run it for several seconds with a steady stream of cold water. Or you can make vinegar ice cubes and run them through the disposal once each week. Add several drops of food coloring to your vinegar ice, so you know they aren’t for drinks! Untangle fibers that catch on the blades by using the wrench supplied by the manufacturer that made your garbage disposal. You can also use the wrench to adjust the nut at the base, then press the red reset button and toggle the switch to get it to restart, if necessary. Cut large pieces of garbage into smaller ones. For example, cut watermelon rinds into small sections, then place these one at a time into the disposal. Grind small bones from chicken and fish and small pits from fruits. These provide a regular scouring along the walls of the disposal chamber that keep it clean and free of buildup. Run cold water down the drain while you operate the disposal. Keep it running for at least 30 seconds to a minute longer after the debris has cleared the drain. The benefits are that the cold keeps the motor and shredder from overheating and helps the waste make its way down the drain more easily. Don’t use your fingers in the garbage disposal. You might cut a finger severely, or even lose it. Instead, use pliers or tongs to pull out debris that may be clogging the disposal. Don’t put fibrous or starchy food items down the disposal. Fibers are the major cause of blockages and clogs. Starches tend to thicken and cause the blades to slow down or stop. A partial list of what to avoid includes banana peels, coffee grounds, potato peels, eggshells, celery, artichokes and corn cobs or husks. Don’t put hard items and nonfood debris into the garbage disposal. For example, avoid items such as unpopped kernels of popcorn; hard bones; shells from crabs, shrimp and other shellfish; fabric; rags; sponges; string; glass; nails; twist ties; rubber bands; hair; grease; and plant clippings. Don’t use a commercial drain cleaner or bleach in an effort to unclog your garbage disposal. Use the wrench that came with it or call a repairperson. Finally, don’t pour hot water into your disposal if it slows down or becomes clogged. This melts any fat already inside, making the clog worse. These simple tips from the experts at Complete Appliance Repair in North Salt Lake, Utah, will help keep your trusty disposer working efficiently for years. Call the Complete Appliance technicians to assist you with all of your garbage disposal maintenance and repair needs. This entry was posted in Blog and tagged DIY Garbage Disposal Maintenance, Garbage disposal Maintenance on August 11, 2015 by admin.